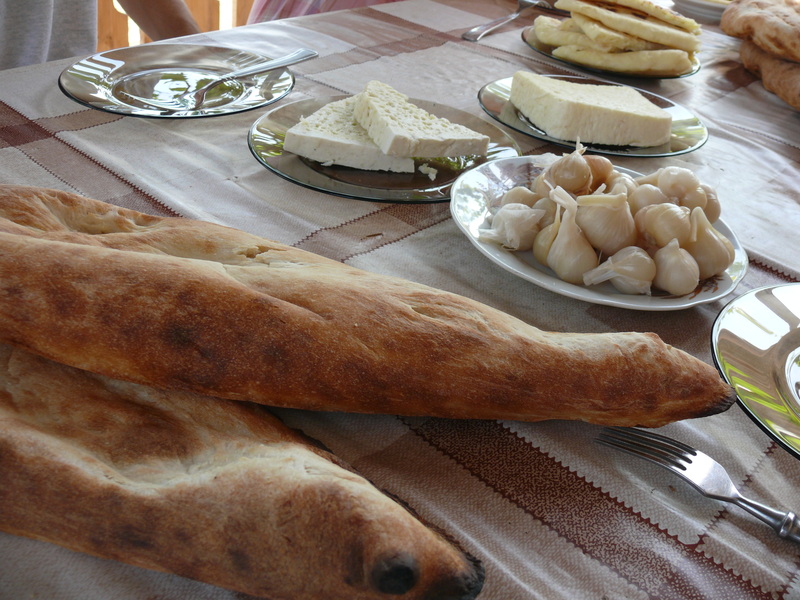 Simple picnic lunch in Sighnaghi, Kakheti, Georgia. 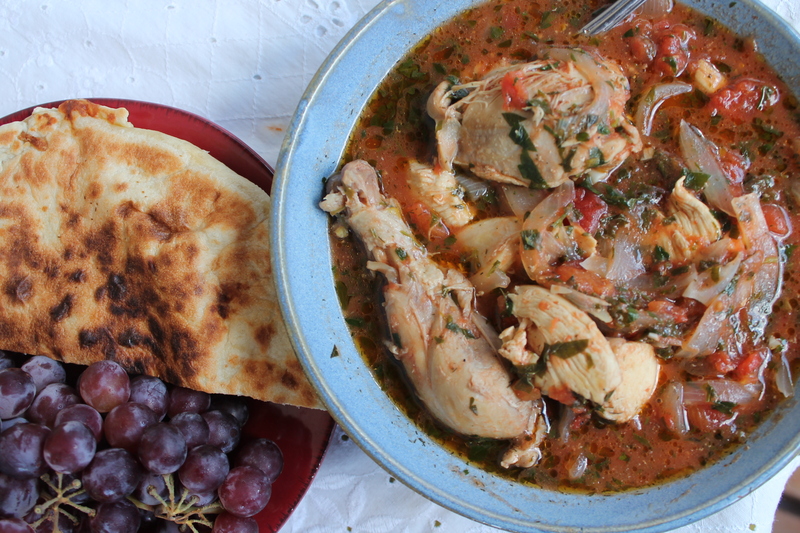 Prior to moving to Georgia, I had no idea what a huge role bread plays in the country’s culinary heritage and the day-to-day life of the people. 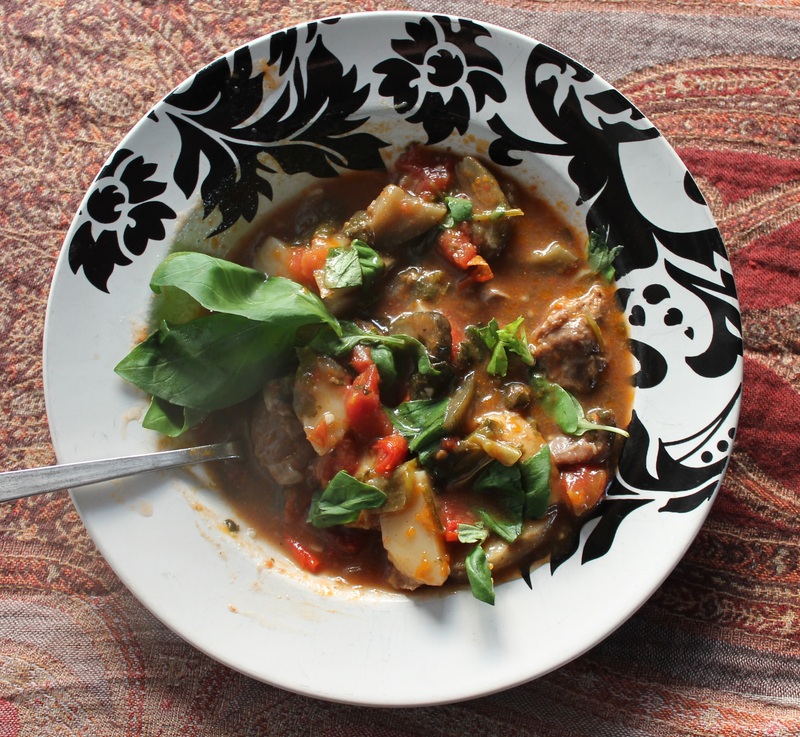 It is present on the table in some form or another at nearly every meal, and, for poorer families, it may make up the majority of the day’s calories, along with potatoes. While low, oblong loaves of European-style white bread are available in most corner grocery stores, it’s worth going out of your way to find a streetside bakery where traditional flat, diamond-shaped loaves are baked on the inner walls of a tone (to-nay), or earthen kiln. The day before leaving Batumi, I stopped by one of these to watch the baker at work and learn all I could about the process. 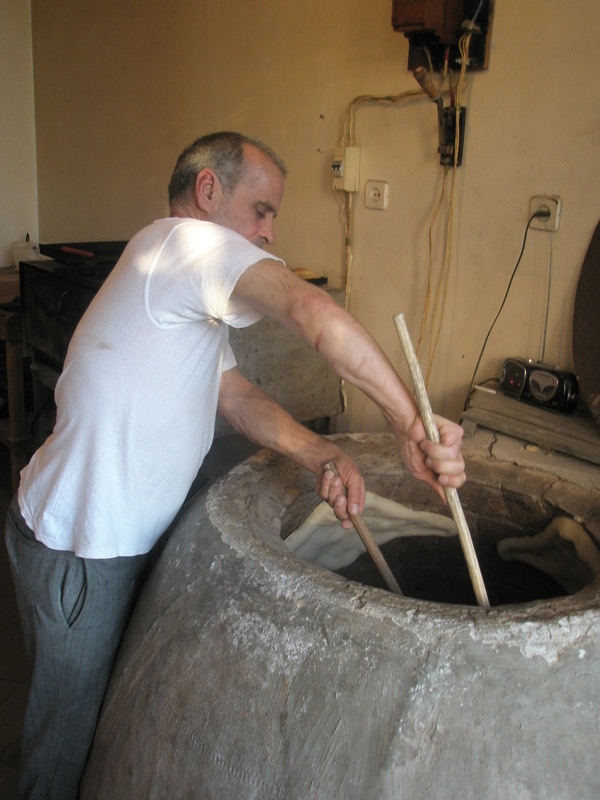 Temur Jikhadze has been baking tonis puri (kiln bread, also known as shotis puri) for 35 years so far, and has no plans of stopping anytime soon. He picked up the craft on the job as a young man and now, he says, “I can make anything out of dough.” I don’t doubt it. His calm and practiced movements between the table where he forms the loaves and the kiln where he bakes them put me at ease: my questions and clarifications seem not to faze him in the slightest. Every morning, he makes a basic dough of flour, yeast, water, and salt, letting it rise in a plastic tub while the kiln heats up. I was imagining him standing there in the flour-dusted dawn light, stoking up a roaring fire, but in actuality he just plugs the oven into an industrial-size outlet. Jikhadze admits he should come in earlier than he does (around 7:30 am), because it takes an hour and a half for the kiln to reach proper baking temperature. But Georgians on the whole tend to be late sleepers, it seems to me, so I can’t imagine he’d do much business before nine o’clock anyway. 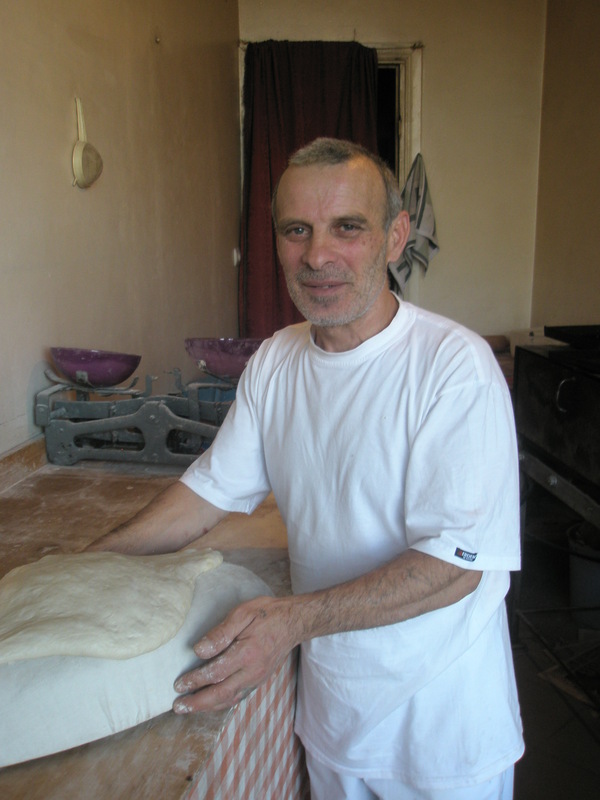 After punching down the dough and letting it rise once more in evenly shaped mounds atop his table, Jikhadze stretches each loaf individually across an oblong form–a wooden board on the bottom piled with a hillock of foam and covered with cotton cloth. He pokes a hole in the center of the dough with his finger, then sticks his thumb into a small opening at the side of the form, removes the kiln’s metal cover, places a folded towel on its rim to shield his skin from the intense heat, and smacks the form onto the inner wall of the oven, leaving the dough clinging to the bricks where it will puff, blister, and brown in 6-8 minutes, depending on how close he has placed it to the source of the heat, near the floor. The salt, he says, is a key element. 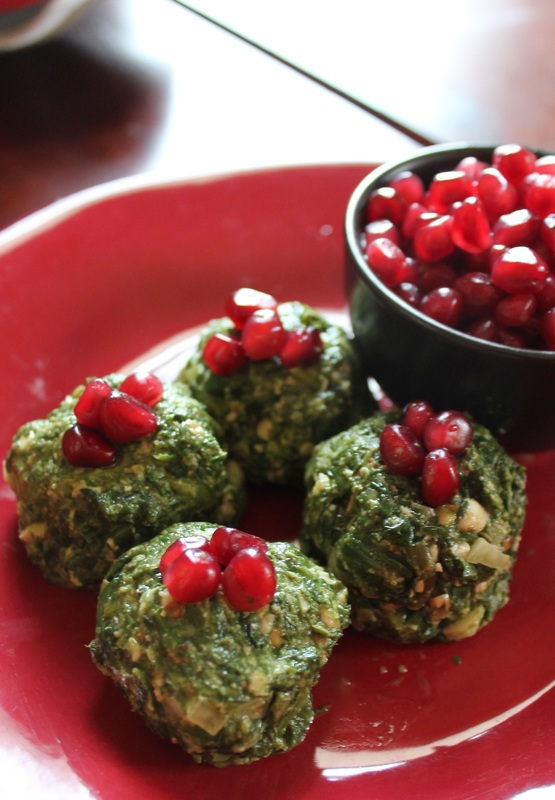 Too much and the bread won’t taste good; too little and the dough won’t stick to the wall of the oven while it bakes. 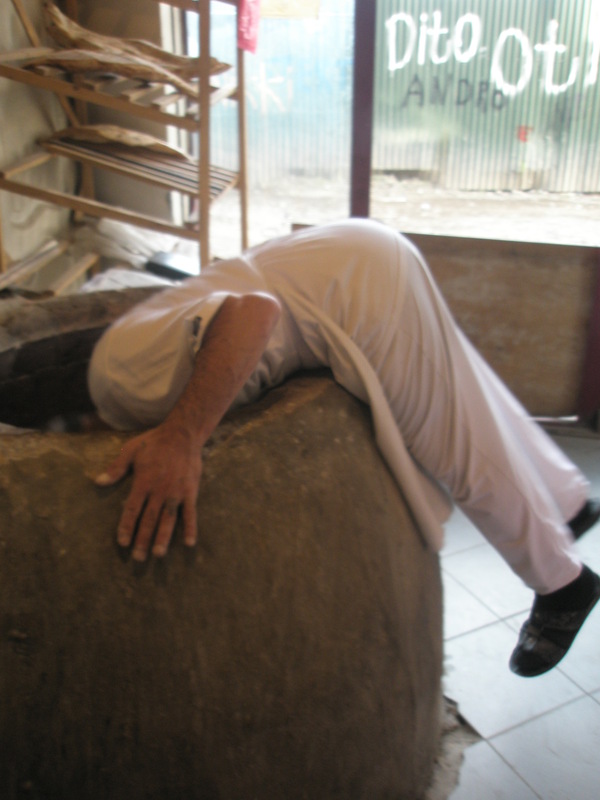 To place loaves deep inside, short-statured Jikhadze must launch himself bodily into the kiln, using his hips as a lever and letting his feet float up off the ground. He smiles wide when I show him the photo I’ve captured of him in this precarious position. Into the tone he goes! The baker must keep mental track of how long each loaf has been baking and when he must remove them using two long wooden sticks, one with a metal hook at the end to poke through the hole in the center of the bread, the other with a metal scraper to pry it gently from the bricks. He transports it on the end of the hook to slatted wooden shelves in the corner, where fresh loaves are cooling. Meanwhile, he distributes loaves for 70 tetri (about 40 cents) each to customers who appear every 3 minutes or so at the open door. 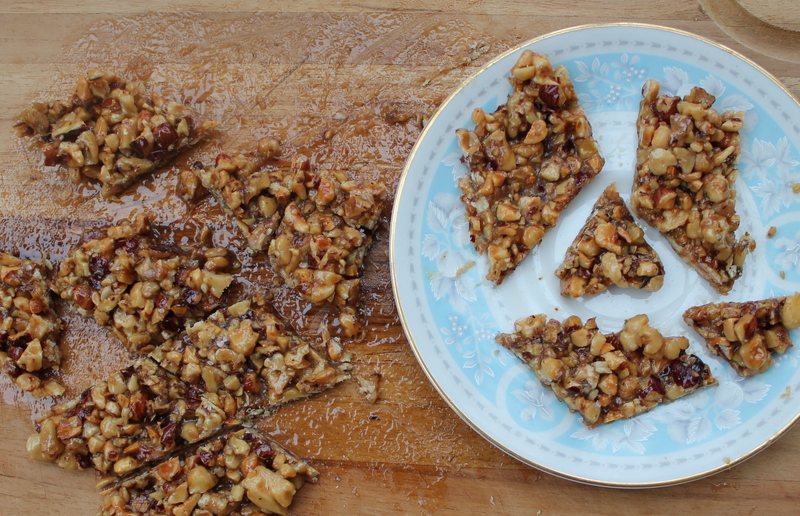 He makes change from a flour-dusted matchbox sitting in front of his dough scale. 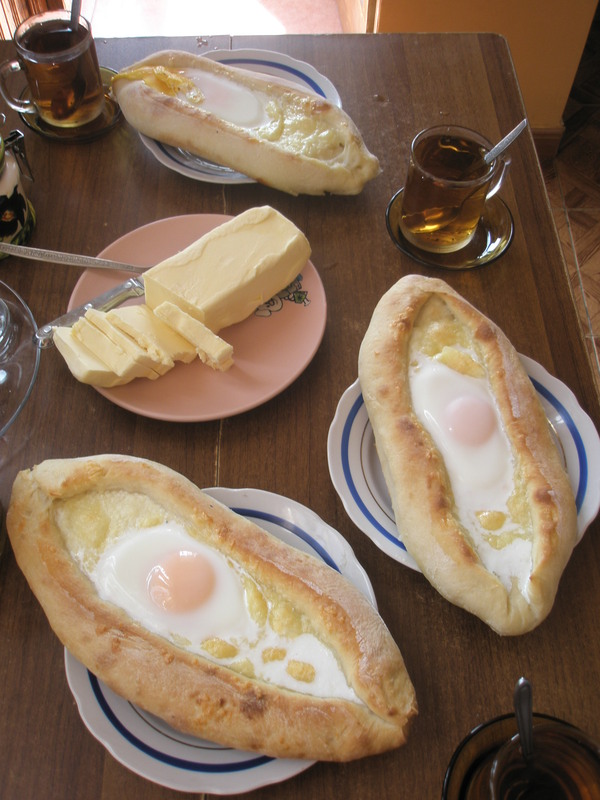 Most Georgian families don’t buy these loaves for their everyday bread, reserving them instead for special meals or those with some kind of ritual meaning. Jikhadze sends me home with a steaming loaf of my own, which I nevertheless can’t help but devour straight out of its plastic bag as I make my way along crowded, exhaust-choked Chavchavadze Avenue. Usually I hate traversing this stretch of the city, but it’s a testament to the quality of Jikhadze’s work that today, I hardly even notice the annoyances. 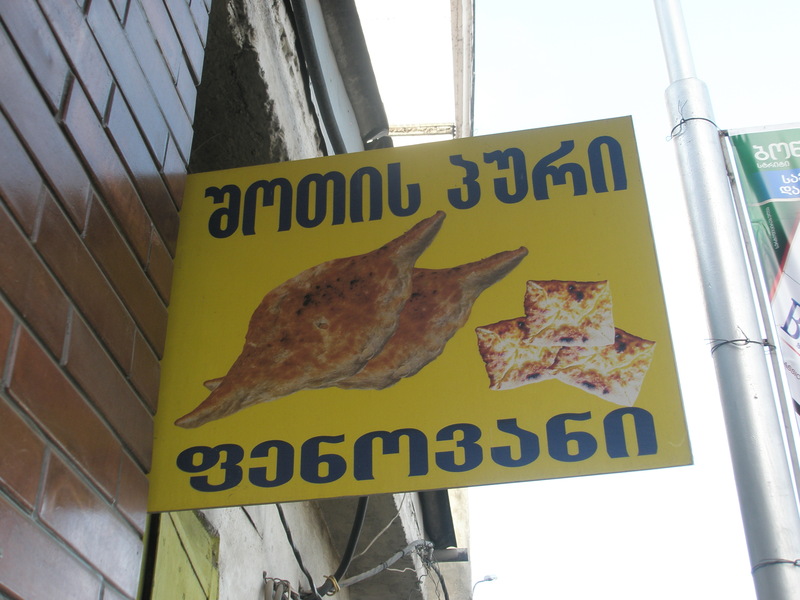 Follow your nose to the tiny bakery at Giorgiashvili St. 6 in Batumi, not far from the port. Don’t leave without also trying one of the penovani khachapuri, a hot pocket of buttery puff pastry stuffed with melted cheese.